Star Wars: Age of Republic Special #1 review: A collection of decent, but forgettable stories – AiPT! 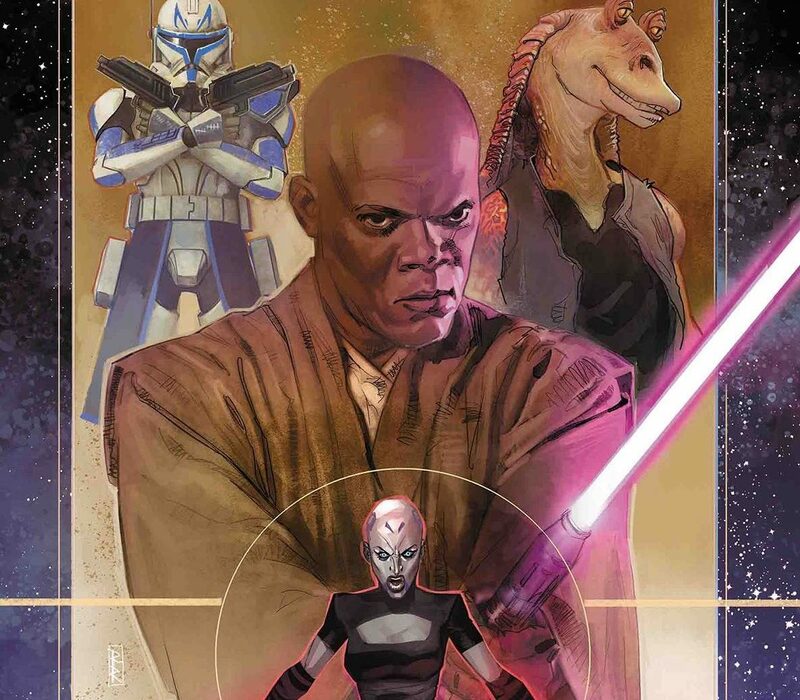 Get ready for more adventures with Mace Windu, Asajj Ventress, Captain Rex, and… Jar Jar Binks? The Age of Republic roars on this week with a special (literally) issue collecting three stories featuring four characters with three separate creative teams. Mace Windu, Asajj Ventress, Captain Rex, and even Jar Jar Binks share the spotlight this week, each taking center stage in the three stories packed into this extra-sized issue that sees Age of Republic mainstay Jody Houser (writing Asajj) joined by Ethan Sacks (writing Windu), and Marc Guggenheim (writing Rex and Binks) alongside artists Carlos Gómez (for Asajj), Paolo Villanelli (for Windu), and Caspar Wijngaard (for Rex and Binks). Unfortunately, each story in this special release is too short-lived to do anything memorable meanwhile begging the question why these stories are being told in the first place. None of the stories in this 36 page issue are bad by any means- each are well scripted with dialogue that feels true to the Star Wars universe and bolstered with various art styles that at best help set the tone for the story and at worst admirably portray the story in a crisp, clean way. Paolo Villanelli specifically does a wonderful job crafting the look of the villainous Guattako the Grim in Mace Windu’s “The Weapon” story. Even the Captain Rex and Jar Jar Binks story “501 Plus One” from Guggenheim is enjoyable despite how annoying Jar Jar remains- he’s as bad in a comic as he is on film. In fact, it’s unclear why Jar-Jar is included here at all since he just drags the story down. Luckily, Captain Rex is endearing enough to make the story memorable still. The standout story for most Star Wars fans will undoubtedly be Asajj Ventress’s “Sisters” story from writer Houser, artist Gómez, and colorist Dono Sánchez-Almara. The story not only features a quick cameo from a beloved Clone Wars and Rebels character, but further cements the fact that Asajj Ventress still had plenty of good in her, almost painting her as a bit of an anti-hero. Meanwhile, Gómez and Sánchez-Almara present an aesthetic that perfectly captures the essence of lower-level Courascant, with flashy neon signs contrasting the dark corners and seedy thugs that populate this side of the city. Like every story in this miniature collection, Ventress’s story suffers from being to short. Given just 10 pages to work with doesn’t allow much room for a memorable tale, and all three stories here suffer from this. Each story is undeniably cool or entertaining- Sacks and Villanelli’s Mace Windu is more entertaining than the entire five issue Star Wars: Jedi of the Republic- Mace Windu mini-series from last year. Despite that, none of these stories contain anything substantial enough to be remembered. Unfortunately, these stories will likely be forgotten by the time the reader slides this issue back into its bag and board. What’s most disappointing, however, is that both Asajj Ventress and Captain Rex are characters that deserve further explanation. Obviously both the Clone Wars and Rebels gave these characters their due, however this Age of Republic line could have been a wonderful chance to introduce Star Wars fans who may be less-familiar to these characters via their own one-shots. Instead, fans are treated to yet another Darth Maul story and Obi-Wan adventure (to be clear: I LOVE both those characters. All I am saying is that they’ve been explored plenty in film, shows, and comics- why not give more auxiliary characters some love?). There’s nothing noticeably bad about Star Wars: Age of Republic: Special #1- it is a mostly enjoyable read that stays true to the franchise. Unfortunately, there’s nothing noticeably good about the book either, making it feel unimportant and ultimately forgettable. There's nothing particularly bad about Star Wars: Age of Republic: Special #1. Unfortunately, there's nothing particularly good either. It's simply a mildly entertaining collection of forgettable Star Wars tales. The Asajj Ventress story is a standout tale that really hammers home the notion that she's not entirely bad in a nuanced way. The included 10-page Mace Windu story is more enjoyable than the entirety of the 2018 mini-series based on the character. Each story stays true to the franchise and feels like a natural extension of the film universe. Each story is far too short to be memorable in any way. Jar Jar Binks is an unnecessary addition who is as annoying in a comic as he is in the movies. These stories, while enjoyable, are completely forgettable and largely feel unimportant.